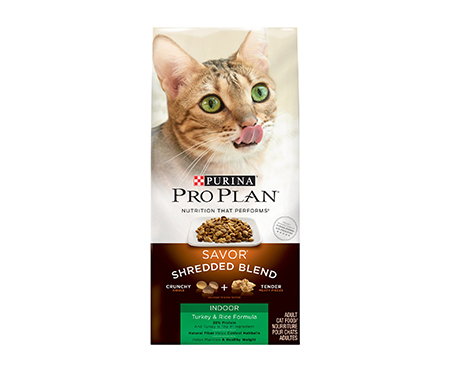 Share an extraordinary mealtime experience with your favorite feline when you serve him Purina Pro Plan Savor Shredded Blend Indoor Turkey & Rice Formula Dry Cat Food. 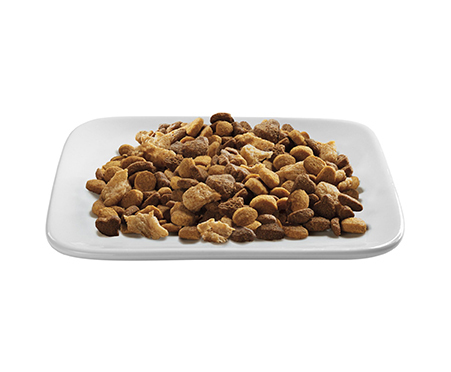 Featuring real turkey as the very first ingredient, this unique dual-texture food includes crunchy kibble and tender, meaty shreds for a taste and texture sensation that’s sure to pique his interest every time you fill his dish. Specially formulated to meet the needs of the indoor cat, this balanced formula contains the ideal protein and fat ratios to maintain lean muscles and healthy weight, along with natural fiber to control hairballs, and natural prebiotic fiber to promote good digestive health. Protein-rich formula features real turkey as the very first ingredient to help maintain lean muscles and an ideal body condition. Unique combination of crunchy kibble and tender, shredded bits creates taste and texture variety that helps prevent food boredom. Formulated for the indoor cat with natural fiber to help prevent hairballs and natural prebiotic fiber from chicory root to support healthy digestion.